The streets are packed. People are singing and shouting. They are wearing team colors; they are drinking, eating, fighting and betting. These fans are not in Green Bay, East Lansing, Philadelphia or Madison. They are in Constantinople, capital of the Roman Empire in 500 AD. They are going to watch chariot races. Some of them will have buried curse tablets around the track asking the demons of the underworld to wreck opposing teams. Others would have been slipping around the stables to sniff horse manure to gauge how teams were going to do. One fan would be so distraught when a famous driver died that he would throw himself on to the funeral pyre! Whole sections of a city would back one team or another, and ancient sports bars provided spots where fans met their heroes. How different are these people from those of us who pour into stadia around the country to watch their favorite football teams, whether professional or collegiate? Team sports shape communities, whether the short-lived ones assembling for three or four hours at a game, or the larger ones of people who might not get to every (or any) games in person, but still have the team colors, and identify, if only briefly, each week with the their team’s success or failure. Other fans are more proactive. A great win or loss can set off celebrations or sadness extending long into the night until they are lit by the glow of blazing cars or accompanied by the sounds of shattering store fronts. Faced with such a sight, a Roman would know exactly what to do. One riot in Constantinople ended with much of the center city in ashes and thousands dead. Why do we have this culture, and why, for that matter, did they? Colleges and Universities turned to sports just before the turn of the last century to build bridges between themselves and their broader constituencies which could not participate directly in the excitement of academic discovery, and to forge links between groups of students studying specialized disciplines which divided them from their classmates. Stadiums became focal points of local pride because the activities within them were about people. The organization that grew up to regulate College Sports, arose out of scandal (deaths on the football field which attracted the attention of Teddy Roosevelt as his son was about to take up the sport at the college level) while pro sports leagues developed in response to fan interest have proved very hard to regulate. Since they tend to reflect the convergence of fan interest with that of management, they are economically independent of theoretical regulators in governments that have largely ceded control to these very groups. Management historically has been interested in maximizing profit and prestige, while fans want greater access and greater excitement, but they can’t do it all on their own. Really powerful sports leagues are products of relatively stable political and economic times—much as the Olympics served as a surrogate for Cold War rivalries from the Fifties through the Eighties, the Olympic movement, and World Cup competitions, have exploded since the fall of the Soviet Union. Ancient Greece and Rome offer us the only other time in human history when as much attention was paid to sport, especially in the first general peace and prosperity three centuries AD enabled a vast increase in spending on sport and continuing for a much longer period of time in major cities where sporting organizations were integrated into the political hierarchy. The most significant sports organizations of the Greek and Roman worlds—the self governing international association of professional athletes in Olympic contests, chariot racing organizations known as factions and gladiatorial troupes—came into being at points of weak governmental control. Circus factions existed in Rome when the state was still leasing most government services to private corporations. The Athletic Associations developed when the kingdoms of the Greek world had all fallen into terminal decline and the greatest gladiatorial impresario of the first century BC was Julius Caesar (whose gladiators were arrested when he invaded Italy in 49 BC because they were thought to be a fifth column). But just as those organizations arose in political vacuums they thrived when the stable regime of the Roman Empire allowed them to manage their own affairs, intervening only to clean up a major scandal (that too sounds pretty familiar). But what lies behind all of this? The crucial factor the uncertainty of the result. “That’s why they play the game,” may be the mantra of Chris Berman on ESPN’s Game Day, but it could be the mantra for all of sport. The athlete is ultimately independent of both the fan and management, and it is with his or her effort, skill, determination and independence that we identify. David Potter is Francis W. Kelsey Collegiate Professor of Greek and Roman History and Arthur F. Thurnau Professor of Greek and Latin in the Department of Classical Studies at the University of Michigan. 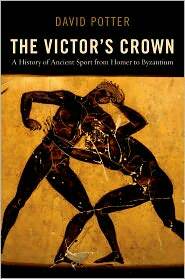 He is the author of The Victor’s Crown: A History of Ancient Sport from Homer to Byzantium.